Late Wednesday afternoon into the evening hours showers with some embedded thunderstorms moved through the area. Rain totals were generally in the 0.10 inch to 0.40 inch range in locations that recorded some rainfall. 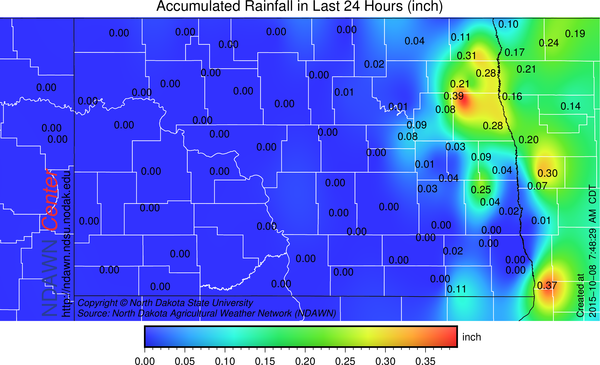 As the map below indicates, many NDAWN mesonet stations recorded little or no precipitation as the rain increased in areal coverage and intensity as the storm system moved across North Dakota which in the end, left only the far eastern part of the state with any moisture and even in those areas it tended to be hit and miss. Today will be a transitional day from “coolish” to very warm. In fact, 80° looks likely for many locations this weekend. Main threat of rain may be a weak disturbance on Sunday night, otherwise, dry through the middle of next week with temperatures a bit above average today and into next week, but well above average this weekend.